The Dude, formerly known as Baby Z and before that, a lil poppy seed, is four months old today. I know everybody says time goes by quickly, but this is almost unreal. Anyway, this has been a great and exciting month. We’re not sure about Zack’s weight since we don’t own a scale and don’t go back to the doctor’s office until next week, but we figure he’s got to be about 17 pounds, give or take a little. And our yardstick just told us that he’s about 26 inches long! He eats 5 to 7 ounces or for about 30 to 45 minutes every three or four hours. And would probably not stop eating if he had a choice. Thankfully, he doesn’t. He’s wearing 6-9 months clothes, although his shirts are usually tight and his pants are too long. The boy’s all torso. We’re also now in Size 2 diapers. We enjoyed our first Thanksgiving and visitors that included Aunt Shelby, Uncle Shamus and Aunt Michelle from New Jersey and an honorary aunt and two honorary uncles from Baltimore. We met new friends David, Lexie and Hailey, too. Zack has seen his first snow, albeit briefly and only in flurry form so far. 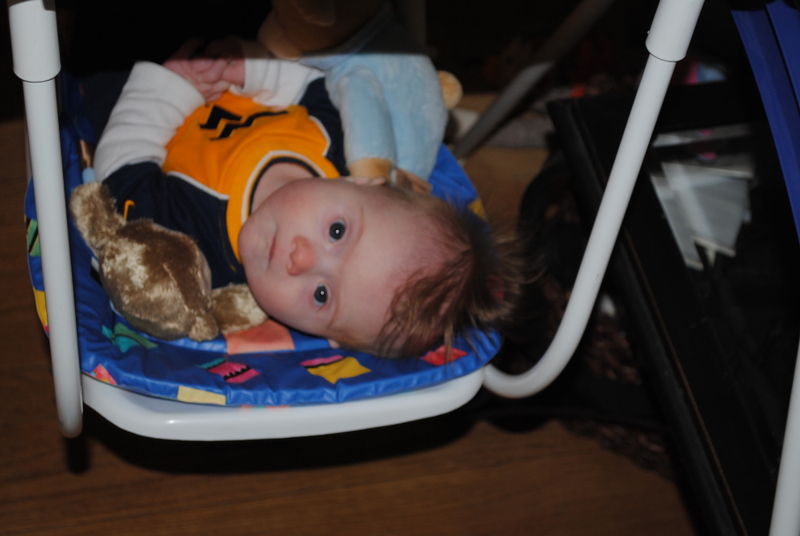 Momma got her brand new, fantastic camera and has been obsessed with taking Zack’s photo this month. The mohawk continues to grow. 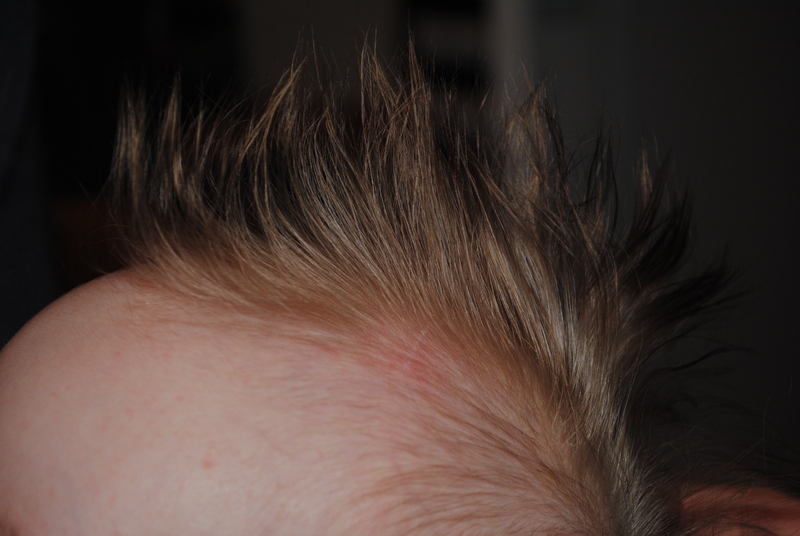 Z’s hair is getting much longer and some days it stays relatively flat, but it looks REALLY ridiculous then, with some plastered against his head and some flipping two inches up in the air. We get so many comments on his hair, and we love it (even the old ladies who yell at us for “doing that” to him). 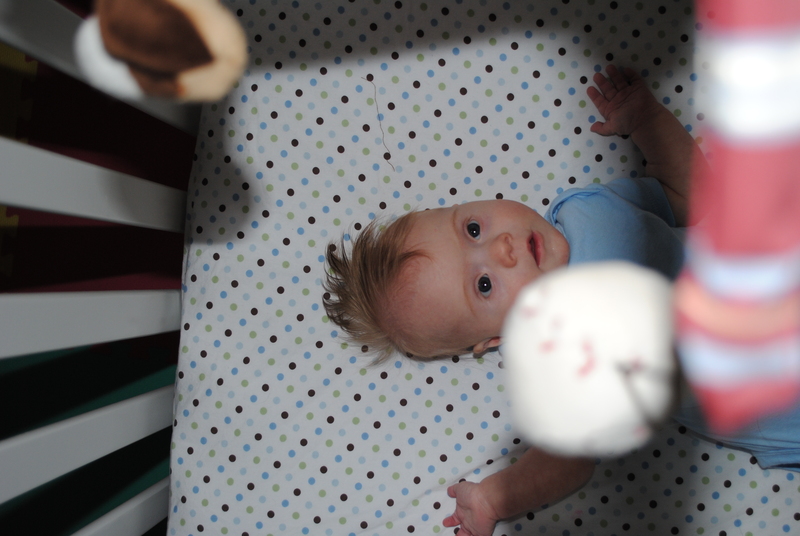 We gave up the swaddle this month after Zack made it a game every night and every morning. He’d toss and turn and talk out loud as he tried to get first one arm, and then another arm out of the fabric. If the velcro was loose enough, sometimes he’d even get his legs out and it would turn out to be more of a cape than a wearable blanket. 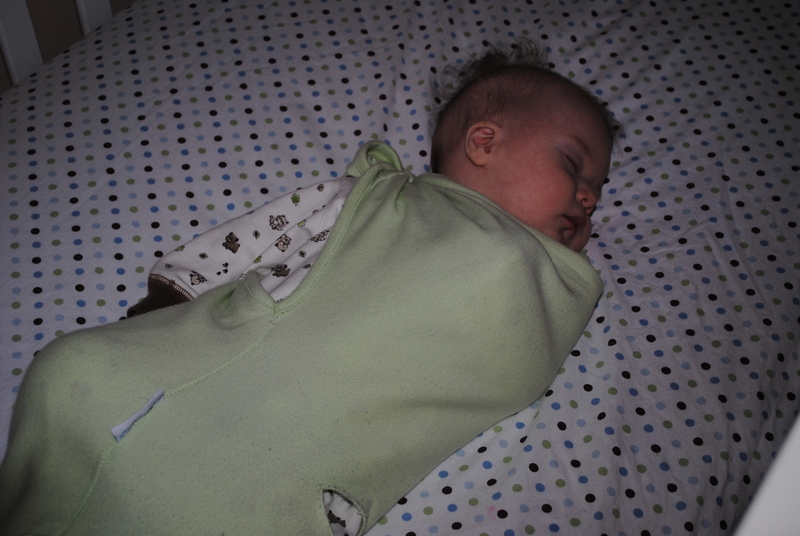 He sleeps in a ‘sleep sack’ now, which is going much better. Zack is very curious and observant now. Suddenly, he sees EVERYTHING, whether it’s a moving person or a new toy or the lights on the Christmas tree. He just HAS to follow things with his eyes, studying every detail. 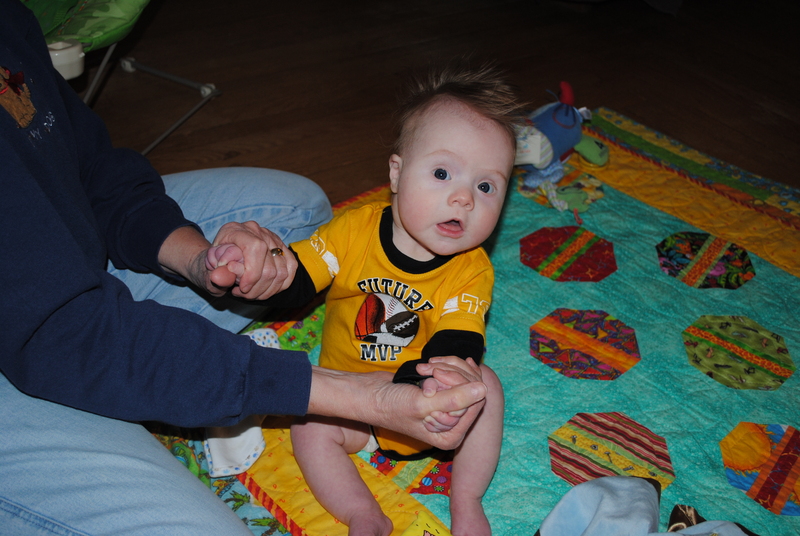 Zack has just, in the last few days, and thanks to our physical therapist Kathleen, started to sit up better and for longer periods of time. It is the first of many amazing feats that I feel I’ve been waiting and waiting and waiting to experience. The anticipation and delay is so worth it. My other favorite thing that Zack is practicing often is his smile. 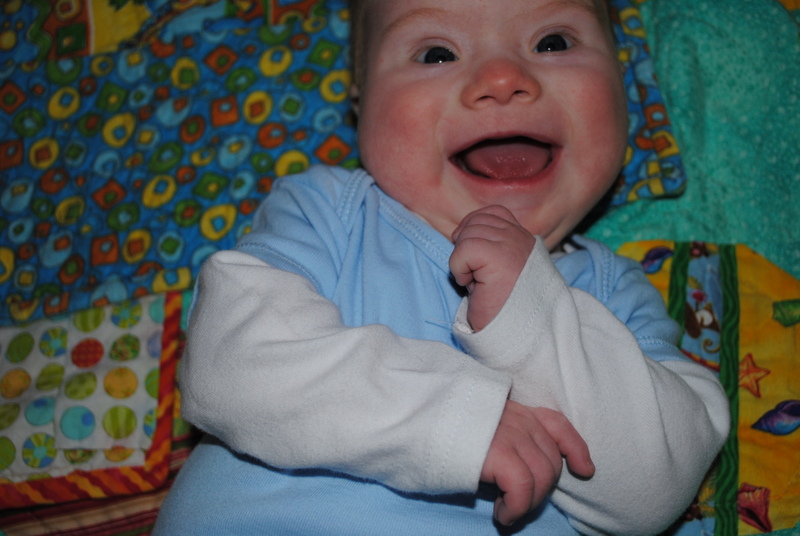 It’s a gorgeous, huge smile that just fills up the entire room. And his giggles. Oh, don’t get me started on the giggles. He gives them out for free and they’re worth so very much. Man, I love the giggles. Zack isn’t the only one that grows each month. Scott and I both learn so much from him and about him. Scott has always been a great father, but now it’s just so amazing to watch. 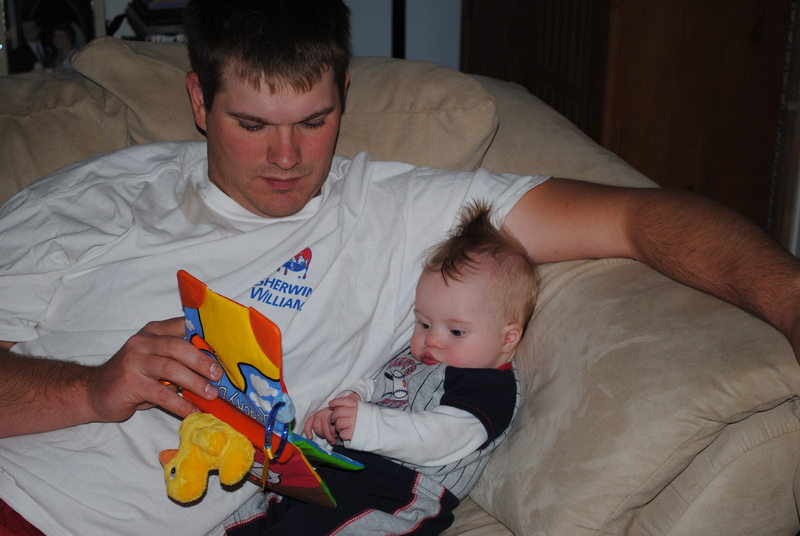 He and Zack are most definitely going to have a special bond that no one else can every compete with in this lifetime. 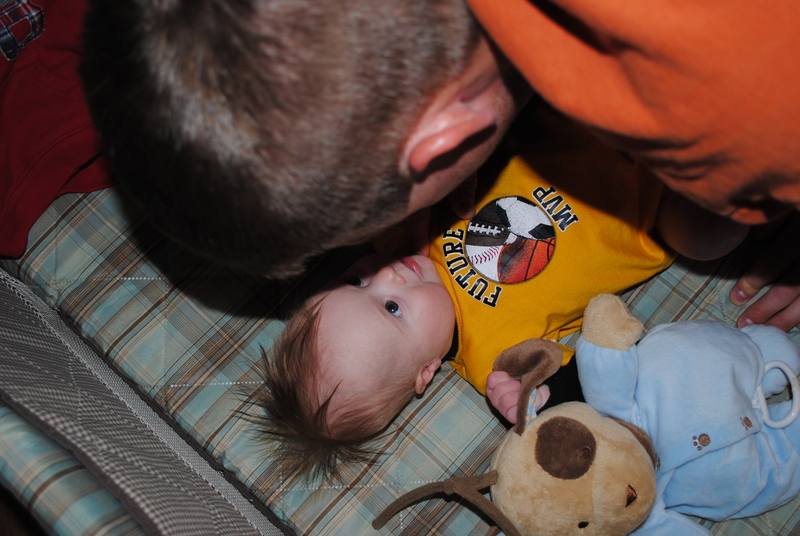 My favorite time of the day is waking up and listening to Zack’s babbles (he now talks to the puppy decal on the wall above his crib) while I get dressed and ready for work. I go in to his room and am, on some days, greeted by a sound that seriously sounds like “hi” along with a signature Zack Smile. My world is complete in those moments and empty when I’m not with him. I love, love, LOVE those big smiles!! How is it possible for Z to keep getting cuter each month? Happy 4 month birthday buddy!